Dancing Times: Britain’s leading monthly dance magazine. Dedicated to dance since 1910. 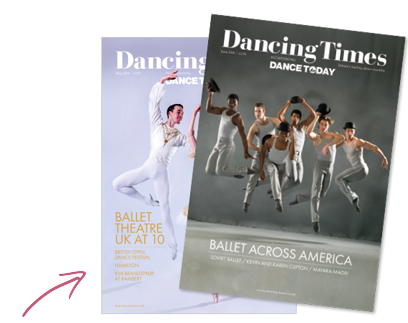 If you are new to the shopping cart, and purchasing a new subscription to Dancing Times, please add your items to the basket, and follow the process, when prompted to 'Log in' or 'Register', please click 'Register' and complete the details, and continue with your purchase. If you are new to the shopping cart and wish to renew your subscription to Dancing Times, please click on the 'Renewals' tab below and click on 'Find my account' enter your subscriber number, last name and postcode detailed on your renewal letter, select the relevant renewal offer, register when prompted and continue with your purchase. If you're having difficulties registering or logging in, please call +44 (0)1778 392039 Mon-Fri 8-6pm or Sat 9-5pm or email [email protected] and someone from the team will be happily assist you. 12 issues for the price of 10! Pay just £39.50 by annual Direct Debit and never miss another issue of your favourite magazine. Saving included in the price shown. Spread the cost and pay just £21.50 half yearly and never miss another issue of your favourite magazine. 12 issues for the price of 10! Pay just £39.50 by credit / debit card for 1 year (12 issues). Saving included in the price shown. 24 issues for the price of 19! Pay just £75.05 by credit / debit card for 2 years (24 issues). Saving included in the price shown. 36 issues for the price of 28! Pay just £110.60 by credit / debit card for 2 years (24 issues). Saving included in the price shown.